What a tough day for freebies, I don’t want to post any of those offers that say you have a chance to win because who has actually won? Not me ever! Luckily, to save the freebie day you can get this free Lord, Teach Me How to Pray hardcover book. 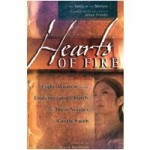 Get a free copy of the religious book, Hearts of Fire. The Voice of the Martyrs invites you to request a complimentary copy one of their bestselling books, Hearts of Fire.